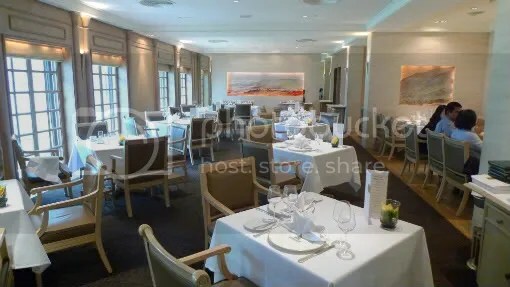 Goodwood Park Hotel brings back fond memories for me as I used to frequently patronise the high tea buffet there as a child. 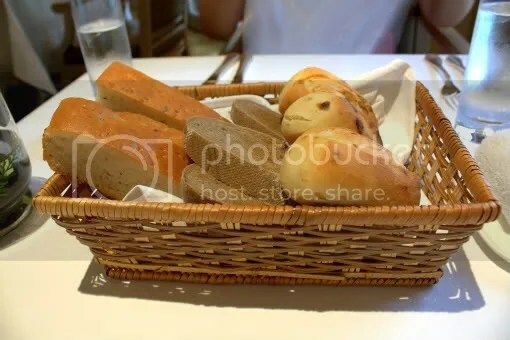 Growing up in my teenage years, the trips to their high tea buffets were replaced by visits to the delightful Chinese cuisine of Min Jiang and Thai Village, both housed within the hotel premises. Somehow or another, Gordon Grill was never part of the agenda…till now. Gordon Grill currently offers a UOB Chef Creation lunch and dinner set menus priced at $68++ and $128++ respectively for 2 pax (promotion ends 14 January), as well as the Big-on-Small Lunch Set Menu priced at $48/58++ for 3/4 Course. 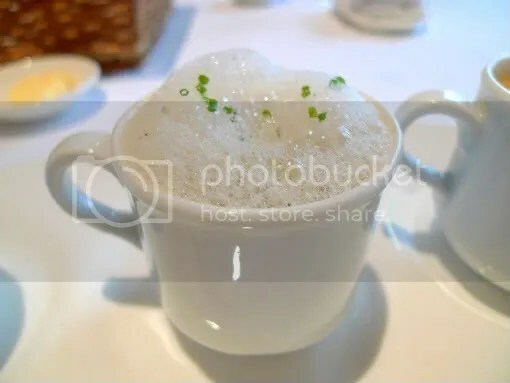 I had some doubts about the quality of the UOB Chefs Creation menu because it was priced at a significant discount compared to the normal lunch set menu but I would soon find out that I was just being overly paranoid, a trait inherited from my paternal side no doubt. Anyway, you have to request for the UOB Creations menu specifically as it is separate from the main menu. After a quick perusal of the menus, we decided to have one pair of UOB sets and one daily set. For the UOB Chef Creations set, it comes as a 3-Course set with Appetizer, Main and Dessert. 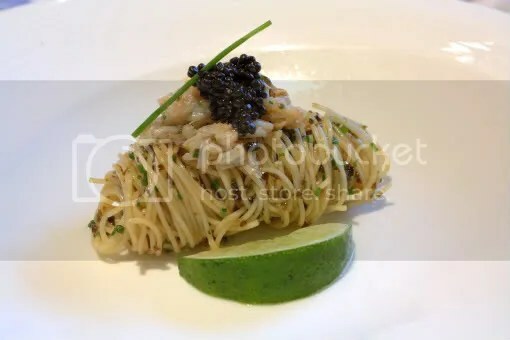 For Appetizers, M had the Cold Japanese Noodles, Seaweed, King Crab and Farm Caviar. 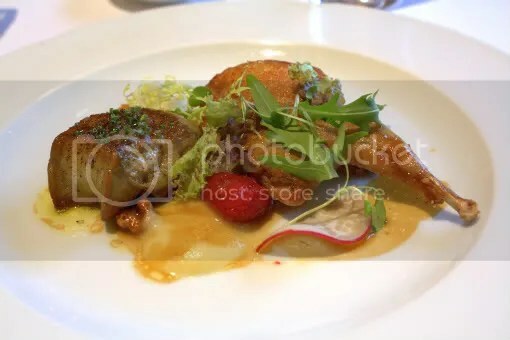 I was pleasantly surprised by the portion size of the Salad of Jumbo Quail, Foie Gras, Raspberry and Walnut Dressing. It seriously looks generous enough to be a main! 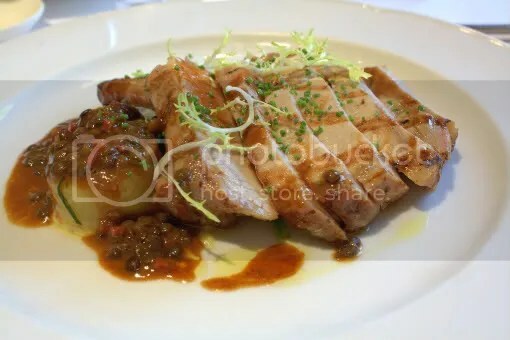 I have always associated quail to be a scrawny chicken which somehow costs more and my last encounter with it at Bistro Petit Salut wasn’t very memorable. Too many tiny bones, troublesome to eat and not much meat. Discriminations aside, the quail here is really tasty! It’s like a miniature yummy duck confit. Regrettably, the foie gras didn’t create a similar impact. It was undercooked, had a large irritating tendon that hampered my cutting, and had a weird aftertaste (maybe not as fresh as it should be?). Hopefully this is just a one off incident. Moving on to the Mains, M had the Baked Barramundi with a Light Shellfish Risotto and Tomato Vinaigrette. 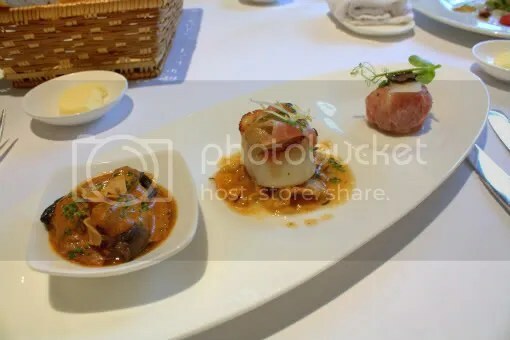 While I appreciated the freshness of the fish which boasted a gentle sweetness evident upon the use of very subtle flavourings, it was a touch too bland for my personal liking though I enjoyed the risotto with toppings of clams, scallops, prawns and a tangy tomato vinaigrette. The other choice of Main was the Grilled Yorkshire Pork Loin with Potato Fondant and Puy Lentil Ragout. In my opinion, a good way to distinguish a well-executed pork loin would be to see whether it is enjoyable to eat without any accompanying condiments. Few have passed this test but I’m glad this one did. The pork was tender and its cooking was perfectly timed, served with an almost indiscernible pinkish hue. D was head over heels for the Pistachio Creme Brulee with Vanilla Ice Cream. It was slightly denser than average but it was really good with just the right amount of sweetness. The Vanilla Ice Cream was kind of superfluous but who’s complaining right? The only other choice of Dessert for the UOB Set Menu is the Coconut Panna Cotta with Tropical Fruit Minestrone. It didn’t leave much of an impression on me but I did enjoy the sherbet! On a random note, I just found this out today; the difference between a sherbet and a sorbet. 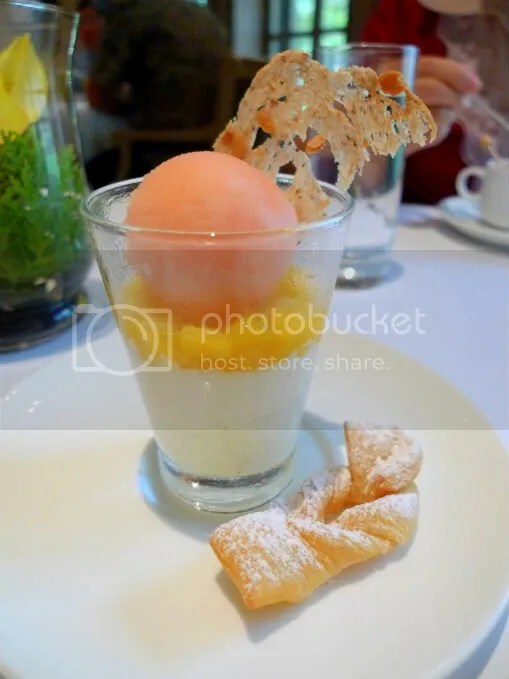 A sorbet is diary-free while a typical sherbet has 1-2% milk and sorbet has a generally softer texture. That’s it for the UOB Lunch Set Menu and proceeding on to the 4-Course Big-on-Small Lunch Set Menu. The Big-on-Small Set Lunch is really good for those who love variety. You get a choice of 3 Appetizers, 3 Soups, 1 Main and 2 Desserts! For Appetizers, I chose the Wagyu Beef Carpaccio with Celeriac Remoulade and Parmesan Cheese Shavings which I thought was so-so. 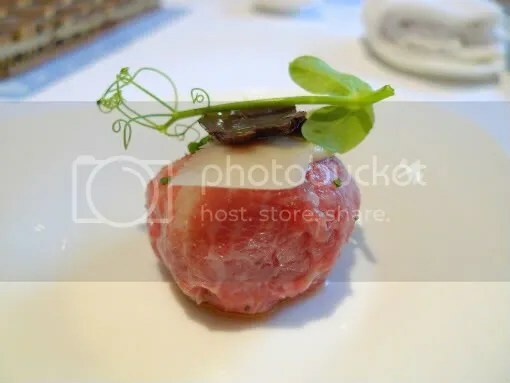 The Celeriac (a type of celery) was hiding within the ball of beef and I felt that its presence was unnecessary for I’m a carnivore of sorts (or at least when it comes to wagyu :p). On the other hand, I thought the Parmesan cheese was somehow quite compatible with the beef! My 2nd Mini-Appetizer was the Braised Escargots with Red Wine Jus, Garlic Puree and Melted Parsley Butter. It’s pretty good, though I still preferred the one I had at Au Petit Salut just a few weeks back. 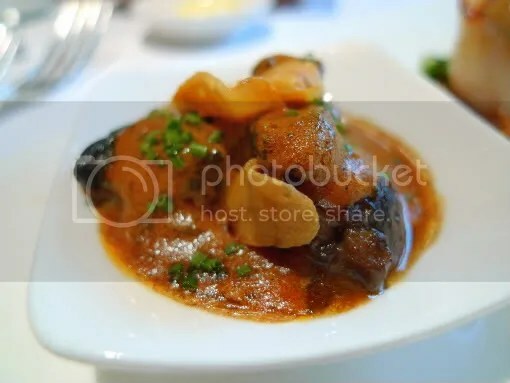 I think it’s probably because the snails here is slightly chewier and there is also a tinge of spiciness (I prefer the classic garlic and butter style). My third Appetizer was the Hokkaido Scallops with Spanish Ham, Green Asparagus and Black Truffle Dressing. 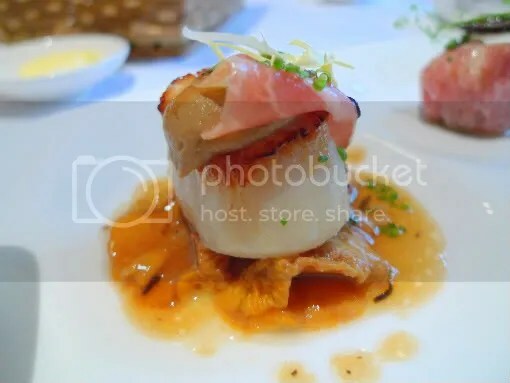 How I do love scallops! I had the Mushroom Cappuccino (which I passed to D). 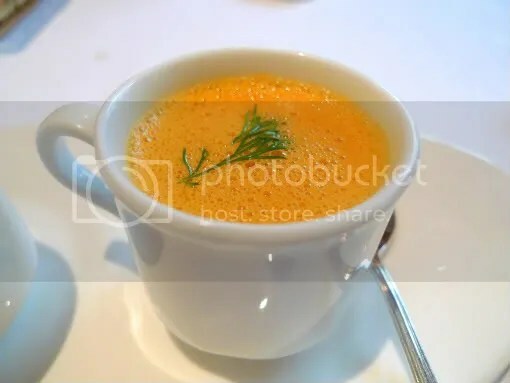 but I kept the Lobster Bisque to myself. 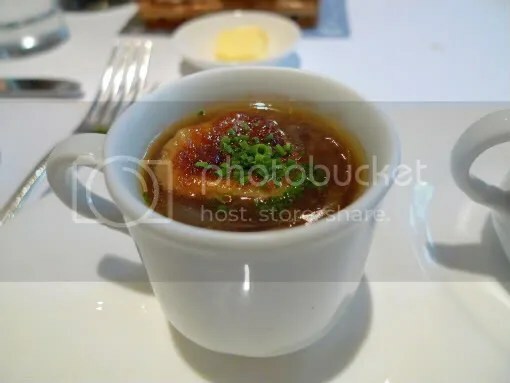 There were 2 small chunks of lobster but it was kind of squishy rather than fresh and crunchy, and the soup was very flavourful though lacking in smoothness. Anyway, I don’t see how a reasonable person would be able to eat and drink so much. 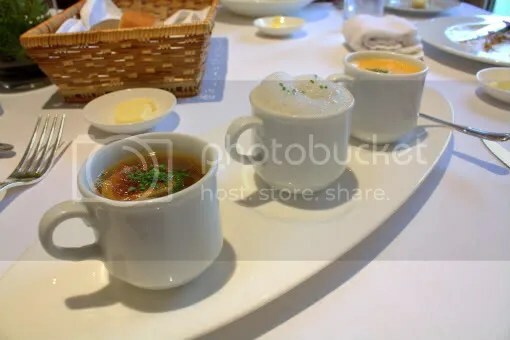 The soups were generally decent but nothing particularly fantastic. 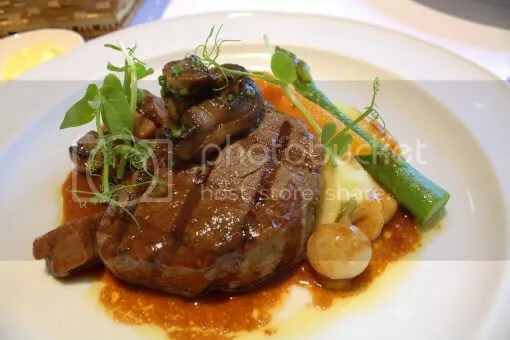 For Main, I had the US Beef Fillet (done Medium Rare) and Braised Cheek in Bordelaise Sauce and Seasonal Mushrooms. Is it even possible for an established joint such as Gordon Grill to get the timing wrong? Well-executed steak and smooth buttery mash, but I thought the cubes of beef cheeks were slightly dry. 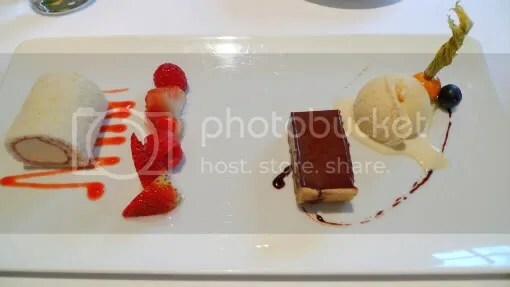 For Desserts, I opted for the Chocolate Hazelnut Tart with a light Orange Ice Cream and the Arctic Roll of Vanilla Bean Ice Cream with Marinated Red Berries. 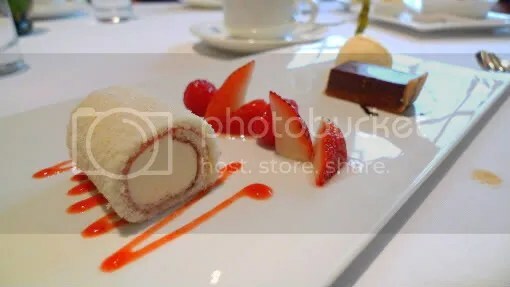 I preferred the Arctic Roll compared to the Chocolate Hazelnut Tart because after such a heavy meal, sometimes I just like to end off on a gentle note, instead of a rich decadent dessert. Normally, the age old adage of “you pay peanuts, you get monkeys” holds true but it wasn’t the case today. 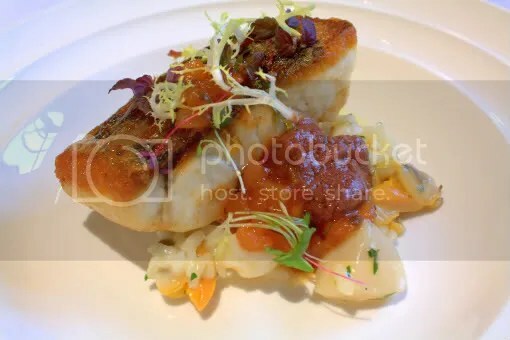 My initial perception that the UOB Chef Creations was just a ploy by Gordon Grill to serve “cheaper” quality ingredients was unfounded as much of the choices in the UOB menu were actually found on the lunch set menu as well. When I think of it, where else could I get foie gras, quail, pork loin and a dessert for under $68++ for 2 pax? My verdict is that the UOB Chef’s Creations is good value for those who want a sample of what Gordon Grill has to offer. I mentioned in the 2nd paragraph that it’s hard to derive life’s meaning but I think I just might have gotten an eureka moment while writing this post. meaning the discovery of one’s life meaning is the very meaning of life itself. 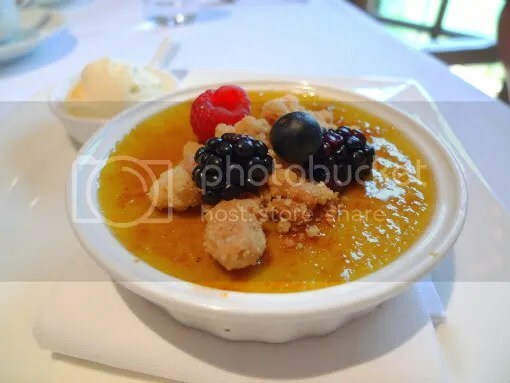 So don’t despair that life is aimless at the moment, use it as a driving force rather than a stumbling block…and if life gives you lemons, go make yourself some lemon sponge pudding. Lemonade you can get at a 7-11. Categories : All YumYums in my TumTum, Chichi, Cuisine Type YumYums, Location of YumYum, Orchard, Western, Yummy!